Andre Brunet Fiddle Workshop, February 2016! This past weekend I had the very great pleasure of being able to attend a small fiddle workshop featuring André Brunet of De Temps Antan! The workshop was held on Qualicum Beach, at the home of the same wonderful couple who hosted the house concert I attended in August 2014. And I was overjoyed to be invited to come back up to Qualicum for this–because as I’d written in that post, for the chance to learn from André, I’d do that long drive again in a heartbeat. You will notice that this was a fiddle workshop, and that I am still not a fiddle player. 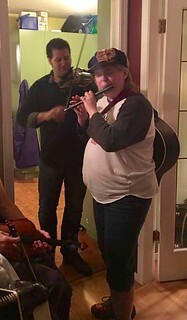 But I am a flute player, and moreover, just hanging out in a fiddle workshop was valuable to me as an exercise in hearing assorted tunes broken down into smaller phrases. Even after a few years of trying, I still struggle to keep up in a full session environment. So it’s hugely helpful to hear someone break a tune down into bits that I can then try to reproduce by ear. It works in my brain the same way that trying to read French does. I.e., it lets me better understand the overall structure and feel of a tune. So I will be leaping all over any tunes workshops I can get. And you guys, this past weekend? Amazing. This time, at least, I didn’t have to get up at four in the morning to cross the border. But I did leave pretty early nonetheless, since this was a holiday weekend in the States and I expected traffic to be on the heavy side. Plus, the weather was generally unpleasant. And even though I didn’t need to rush north at top speed, still, I didn’t want to risk getting to Qualicum late! I had arranged to stay at a very nice little B&B, At Nautica Tigh, which I mention because I totally recommend it if you ever happen to be on Vancouver Island and need a place to stay in Qualicum. The owner was not participating in the workshop, though she’d seen André play before. But she was very close to the Beatons’ house, so it was therefore very easy for me to get to Qualicum, do a few errands, drop off luggage, and then zoom over to the Beatons’ for the weekend to kick off. And boy howdy, did it kick off. Because André graced us with a delightful little concert that turned out to be his very first solo show ever. This does sound a little surprising at first, I grant–what professional musician has played for years without doing a solo show ever? The professional musician who’s been busy playing with three, count ’em, three different bands, not to mention duo work with his brother, that’s who. And when one of those bands has been La Bottine Souriante, it suddenly becomes entirely reasonable that M. Brunet has just never had the time to play solo. What got played included several things that were familiar to me, and several things that were not. I recognized “La ruisseau français” and “L’homme et deux femmes” and some of the material that called back to André’s experience with La Bottine. I did not recognize “Plaid tuque reel”, “Son of a Bear”, or “Reel du Drummondville”, though I have PDFs of the latter two in my collection and will clearly have to investigate them! André didn’t limit himself to the fiddle, either. I already knew that he could also play guitar, and he deployed that skill for us here. He sang “Le charbonnier” for us, a song I was familiar with courtesy of Les Charbonniers de l’Enfer, to whom André did in fact give a shoutout–along with specific shoutouts to André Marchand, Normand Miron, and Lisa Ornstein! Though really? We were there for the fiddle, and the man is a firecracker on the fiddle, even when he’s playing all by himself. Not that it was entirely a solo show the whole time, though. André did recruit our hostess Joyce, herself a fiddle and cello player, and a gentleman named Dave Barta on the accordion, to play trio with him a couple of times! Joyce and Dave both play as part of Celtic Chaos, and their contributions to André’s performance were excellent! Another Lisa Ornstein shoutout happened when the three of them did one of her waltzes. Here, have a few pics I got! In between all the songs, André told us a number of delightful little stories as well, about his own background as well as the general area of Quebec he’s from. But what really made me sit up and take notice was how he said that for his next birthday–his 40th–he’ll be giving himself the present of recording his first solo album. So right then I’ll be buying the hell out of that. Because yep, André’s way up on the list of Quebecois Musicians For Whom I Want Every Single Note They’ll Ever Record. If you like fiddle music at all, you should buy that album too. Friday after the concert: session! Full-bore session mode kicked in after André concluded his performance, at which point the rest of us got our instruments out. I was prepared to mostly try to noodle along as best I could, and didn’t expect to be able to pick up much. So people told me to play it. Again, a bit skittishly, I raised my flute–at this point, I had the little D in my hands–and started playing. Partway in, a fiddle kicked in right behind me. Because André had gotten his fiddle, and he was now playing along with me. You guys, I had a duet with André Brunet. You may imagine that every neuron in my brain started firing off at that point, demanding that I keep it going. I did. And when I tried to finally stop, Joyce was all “no no keep playing!” because she wanted to take a picture. Which she did, and which showed up a little while later on Facebook, with me tagged. So, um, yeah. That was a hell of a way to start off the weekend. And we were only just getting started. When we regrouped the following morning, we were all in various stages of wakefulness. After all, after a night full of full-blast session, people are going to stay up pretty damned late. But it wasn’t anything that judicious amounts of coffee (or in my case, tea!) couldn’t handle. And at a nice civilized hour of 9:30 or so (by which I do actually mean 9:30, as opposed to musician-time-9:30, which could go as late as 10:45), we got started with the main business of the weekend: serious tunes learning! We charged through a total of four tunes on Saturday: Gigue du Commerce, Fort Worden Reel, Ré-la St-Côme, and a fourth reel that we didn’t get a name for. Notable here: WOO FORT WORDEN! That’s the place where Fiddle Tunes happens, and now that I’ve actually been to a Fiddle Tunes, it was quite wonderful to learn that a gentleman by the name of Yvon Mimeault had written a reel in its honor. And “Ré-la St-Côme” is known to me from De Temps Antan’s own first album! Of interest for me on the Fort Worden Reel: the arpeggios in the C part go down too low for my flutes’ ranges, so when I practice this one, I’ll need to try to arpeggio up. And speaking of arpeggios, André did actually talk about those as being very common to the vocabulary that makes up so many tunes. Which tells me I need to practice my arpeggios more. For those of you unfamiliar with the musical term, an arpeggio is what you get when you go up a scale but only hit the notes that’ll make a chord. So for the C-D-E-F-G-A-B-C scale, an arpeggio would come out C-E-G-C.
Of interest on “Ré-la St-Côme”: the “Ré-la” part of the name is actually a reference to the musical keys “Ré” and “La”–what English speakers would call the keys of D and A. Should I get to actually make it to Camp Violon Trad in the next couple of years, this will be critical information to have at my disposal: remembering that the do-re-mi-fa-so-la-ti-do scale is what French speakers use to identify their musical keys, and that this maps to C-D-E-F-G-A-B-C for English speakers. Since this was my second time learning from André and my fourth time in a tunes learning environment, at this point I knew what to expect: i.e., that André would play the tune fast for us, then slow, and then we’d break it down into phrases to try to get it into our brains and our fingers. This is a learning strategy that does in fact work well for me. It’s also worth noting that with my writer hat on, it was interesting in general just to pick up on several little details that might be useful later when writing Kendis or any other fiddle player likely to show up in the Warder books. Things like, say, the palm of the right hand getting a lot of work, that the wrist and the fingers are important for bow control, that your motions will be a bit more exaggerated when you’re playing a reel, and that you can try to control your motions if you practice with your elbow braced against a wall. As soon as André described doing that, I could see Kendis doing that as a kid! But I think my favorite thing he told us about was something I’d already picked up on in other contexts. He encouraged us to try to listen to the whole feel of a tune, to get the pulse and the rhythm of it, and this is actually something I’d figured out in the context of reading in French–i.e., even when individual words and phrases don’t necessarily make sense to me, just reading fiction in French helps build a sense in my head of the pulse and rhythm of the language. So this made absolute sense to me. Which I did, in fact, get to tell André later. We took a long break after all that work, while people dispersed to take a rest and get ready for dinner. Me, I hung out quietly in the kitchen for a bit to have some tea. And I wound up actually having a lovely long chat with André! Involving considerable music geeking on both our parts. I learned that André played saxophone in school and that his wife–one of the ladies in Galant Tu Perds Ton Temps! Whose albums you should also be buying if you have any interest in Quebecois trad–is a flute player! \0/ And I told him a bit about my own family musical background (my dad having been a sax player and my older brother being a rock drummer), and my background in school band. There was geeking out about movie soundtracks. There was language geekery. And there was me mentioning that I’d really like to go to Camp Violon Trad for the guitar track of instruction there–but that I was really nervous about taking my guitar on a plane. Because if I’m going to show up for a Srs Bznz music camp, I want to have the General, my best guitar. Which is of course why I took the General to Fiddle Tunes. 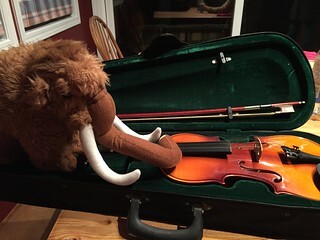 But Fiddle Tunes did not require me to get on a plane, and I know way, way too many stories about musicians at various levels of activity, pros and amateurs, who’ve had their instruments wrecked. To which André very firmly said to not take the risk. And folks, if a professional musician tells me not to take my best guitar on a plane, y’know what? I’m gonna listen to him. BUT, he also said, if I do come to Camp Violon Trad, he’d help me get a loaner guitar! And y’know what? If the professional musician who runs Camp Violon Trad says he’ll help me borrow a local guitar if I come to his camp, WHELP I GOTTA DO THAT THEN DON’T I. 😀 This is going to happen. Oh my yes. It WILL. All of which I mention by way of exhibit B in the case for Why André Brunet is Awesome. Hold that thought. I’ll be coming back to it. Saturday evening: ceilidh and dance! But wait there’s more! Saturday’s shenanigans weren’t done yet, because after we all had dinner, we did a ceilidh in which a bunch of the workshop participants got to get up and sing, play, tell stories, whatever we all had to share with folks. There was, unsurprisingly, a high amount of fiddle playing from other folks, some solo, some group. I was particularly impressed by the young lady who, with André’s backup assistance, got up and played her own original composition, “The Hedgehog and the Lozenge”. Which, she informed us, was named after she struggled for quite some time to find a title for the tune, only to have that lobbed at her decisively by her roomie. So she went OKAY THEN! and ran with it. We were also all very, very impressed by the lady who told us a version of “The Three Little Pigs”, only done with spoonerisms. Which started cute and just built and built until we were all giggling by the end. The ceilidh finished up with Joyce, Dave, and several others who’d gotten recruited doing a big rendition of “Bonnie Ship the Diamond”. Including me, since I got pulled in to play guitar! (This is what I got for being the only available guitar in the house besides the one that André had borrowed!) Thankfully, the chords were easy. And approving noises were made at me about the rhythm line I whipped up and some of the accents I was trying to do. But the musical shenanigans for the evening weren’t done yet, oh my no. Because then we had a dance. And that was all very intimidating and very exciting, at least if you’re me and don’t have much in the way of physical coordination. I shall nonetheless note for the record that I did in fact get up to join the dancing at least once, when I was in a group with André and several other women. And the dancing was in fact great fun! I stuck to trying to contribute guitar after that one go on the floor, though. Because, again, only available guitar in the room. So I took a chair and tried to see if I could figure out what keys the melody instruments were doing, and if I could keep up with them. As long as they were in G or D or A, I was okay. For giggles and grins, I also tried to channel Éric Beaudry (c.f. my primary motivator for wanting to attend the aforementioned Camp Violon Trad guitar track) and see if I could do the feet at the same time as the guitar. The train of thought here being, if I had only three chords to worry about and kept to a simple rhythm line, could I manage feet at the same time? Because as I’ve written about before, for me as a player, there’s this sort of zen-like mode I need to get in when I’m trying not to pay too much active attention to what my hands are doing on a guitar–particularly if I’m also trying to sing. Adding the feet in is kind of like that too, since it’s essentially another layer of physical multitasking. See previous commentary re: not too much physical coordination on my part, though. Once or twice I think I actually kind of got it, but yeah, I need more practice. It might have helped if I’d actually had a board to stomp on so I could better hear my own rhythm! For the record, I did in fact get more than one coherent noise off the instrument. Stephanie further confirmed that yeah, this instrument will have issues holding tune, and this seems to be a pretty standard problem for instruments of its type, mass-manufactured ones. Good to know! I spent a bit of time as well just holding the fiddle like a mandolin, and trying to pluck the strings and figure out where all their notes lived. We had a hell of a finish to the evening as well, because while André had a core of fiddlers over in the big group, Joyce got a group going in the kitchen. And at this point, we were well and thoroughly into proper kitchen party territory! From the group in the kitchen, I started hearing strains of something that sounded familiar. And pretty easy to pick up on, for that matter. So I grabbed my nearest instrument, which happened to be the carbon fiber whistle, and wandered into the kitchen to try to play along. Turned out that they were playing this, off the shiny brand new album by Yann Falquet and Pascal Gemme, two more of my favorite Quebecois musicians! I showed up a bit early on Sunday morning, early enough that I got in on some breakfast and a bit more chatting with M. Brunet. Who showed me a recording of “Trois Navires de Blé” he had on his phone! This was a version done by a mixed-gender Quebecois group, Tu M’en Diras Tant! Since I’d told folks that this was the very first song I learned how to play on an instrument with strings and the first song I learned in French, it was super-awesome to hear another version of it. And oh hey look this band has a Bandcamp page so yep, I’ll be buying this album. Check it out, here’s the song on Bandcamp! Les Premières Amours by Tu m'en diras tant ! But soon enough we got back down to business and André gave us a couple more tunes, some of which we actively worked on and some of which he just played for us for later reference. Notable titles here: “Le vieux reel en la” (a.k.a. “The Old Reel in A”), “Le reel du Nord”, “Bergerville”, “Reel de deux Lisas” (which I knew about from our session group! ), and last but most definitely not least, a lovely Claude Méthé waltz called “Berçant”. I’ve had the pleasure of hearing M. Méthé play before, and I’ve got some of his music, so trust me when I say that the good monsieur knows his waltzes. Beautiful stuff. Which, I might add, works splendidly on a flute. I further note, with pride, that as of Sunday morning’s workshop activity I actually succeeded in playing every single instrument I brought with me to this event. When André took us through “Le vieux reel en la”, I thought “HOLD ON THIS IS IN A that means I can play the A flute”! So I happily whipped out Rossignolet, my carbon fiber A, and was very, very happy to be able to play her. After we finished with the waltz, many lovely words were spoken thanking not only André, but all of us for coming as well. Suggestions were raised that perhaps this will become an annual event–in which case I am 120% on freggin’ board. Suggestions were also raised that André should bring his family! Which would be wonderful. But before I could finally take my leave, I had a couple more items of business to attend to. Dejah Leger had asked André to bring one of the new De Temps Antan shirts for her (which you can also buy right over here because again, I am helpful). So I had to get that from André before I left! But he also bought something from me: to wit, copies of Faerie Blood and Bone Walker, after I showed him the dedication he shares with Olivier Demers in Bone Walker. Because I had to make a point of making sure he saw that. Because yep, people who teach me music get books dedicated to them. It’s a RULE. It was only with the greatest reluctance that I finally took my leave. Hugs were given to both André and the wonderful Joyce, as well as assurances to the latter that I would email when I made it safely home. Thanks to Joyce and John and especially André for a beautiful, musical weekend. Jean-Claude and I will be back next year!